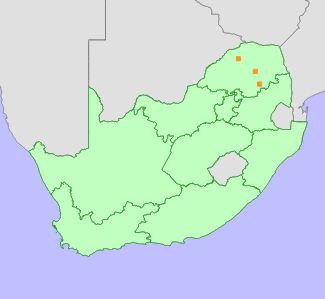 Within South Africa it has a restricted distribution and was known from three locations (EOO 300 km²), two of which may be lost due to afforestation around Haenertsburg. The third location (in Sekhukhuneland) is threatened by ongoing habitat degradation due to deforestation. The status of the population in Zimbabwe is too poorly known to conduct a global assessment. The national assessment is not downgraded based on the regional criteria as there is a large disjunction between the nearest known population in Zimbabwe, Inyangani Mountain, and Haenertsburg. Associated with rocky outcrops, often on moist, rocky ledges in forest where they grow in pockets of sandy humus, 1800 m.
Siebert et al. 2002, provisionally assessed N. zimbabwensis as Critically Endangered in SA owing to the ongoing destruction by humans of the particular forest patches where it occurs. A new and more accessible road has been built to the summit of the Leolo Mountains and wood harvesters are now felling the last remaining large trees of Prunus africana and Kiggelaria africana. In due course the forest microclimate will change and N. zimbabwensis will probably disappear. The Woodbush and Haenertsburg collections date from 1913, 1935 and 1954 respectively. Since then, agriculture and the large-scale establishment of alien tree plantations have destroyed much of the natural grassland and associated wetland vegetation in these 2 areas. The lack of any recent collections from this area suggests that the species is either very rare, or extirpated due to habitat destruction (Siebert and Van Wyk, 2005). Siebert, S., Victor, J., van Wyk, B. and Bredenkamp, G. 2002. An assessment of threatened plants and conservation in Sekhukhuneland. PlantLife 26:7-18. Siebert, S.J. and Van Wyk, A.E. 2005. Nemesia zimbabwensis, a new record for the FSA region with notes on its phytogeographical significance. Bothalia 35(1):69-71.